Happy belated Mother’s Day to all. I hope you had a fantastic day! 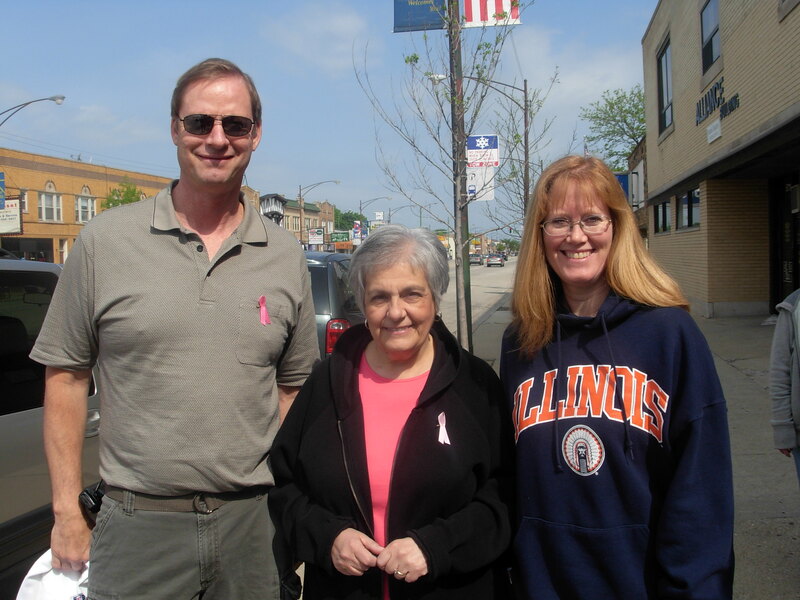 We started out, as become our tradition, at the Y-Me Mother’s Day Race. 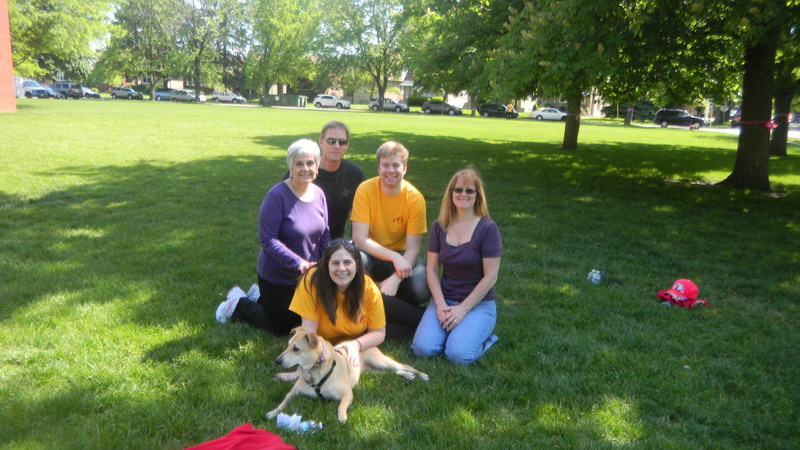 My mom, Dan, my in-laws, Phoebe, and I completed the 5K. It’s really fun in that some local teams organize a race on the Northwest side of Chicago. So, instead of waking up early, rushing downtown, finding parking, and finally getting to the race, we drove a few minutes away and got to walk through our local neighborhood. With travel time so low, we had more of Mother’s Day to do fun stuff. Here is my mom and I at the end of the race. Afterwards, we went back to my parents’ house and my dad had a wonderful food spread just waiting for us. 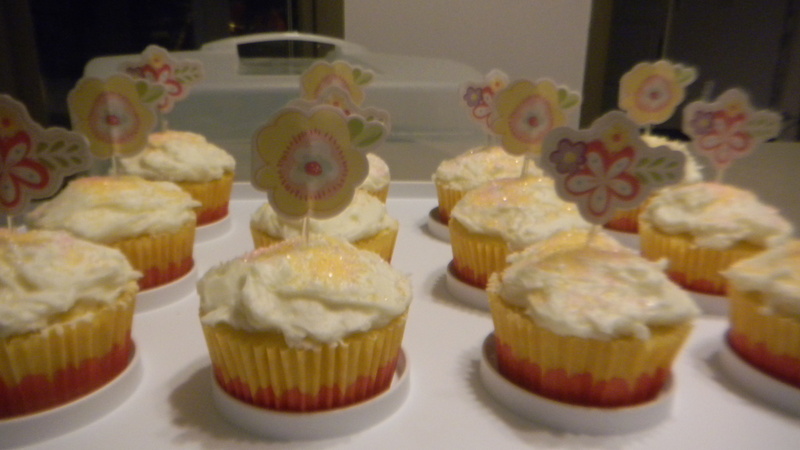 I contributed by baking some lemon cupcakes with coconut frosting. They smelled delicious when I was making them and I couldn’t wait to dig in. I’ll admit, the cupcakes came from a mix, so I don’t have any baking directions this time. I just followed how the package said to make them. 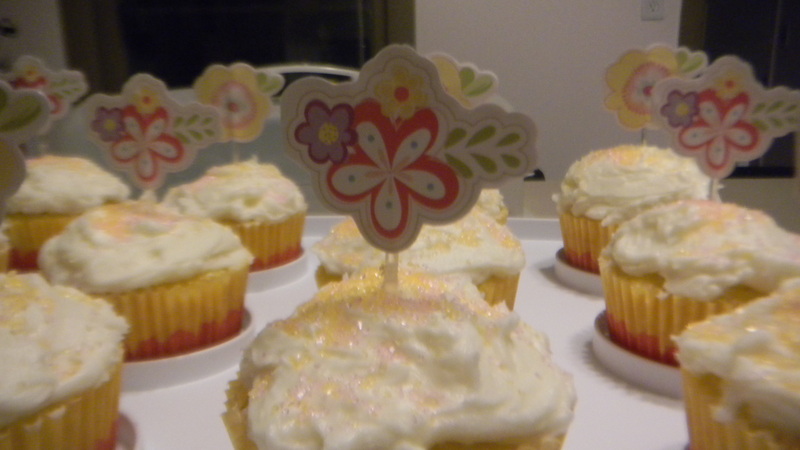 Both mothers commented on how pretty the cupcakes looked with the colorful wrapper and flower toppers. I’ll let you in on a secret. They’re clearance items I bought that were leftover from Easter. Can you believe it? I think the pack which contained 24 wrappers and 24 flower toppers was $4.99 before Easter. Afterwards, I think I snagged the whole set for less than $1. Once we were all quite full, the athletic half of the family went for a bike ride (yep, after completing a 5K!). My mom and I took it easy and headed for some serious shopping. The haul: mom got a new lamp found on clearance at Homegoods. I got a dress and some frames at TJ Maxx. It was surely a fun day had by all! I hope you got to enjoy the beautiful day with your mom! This is sure to be a busy, but fun weekend. 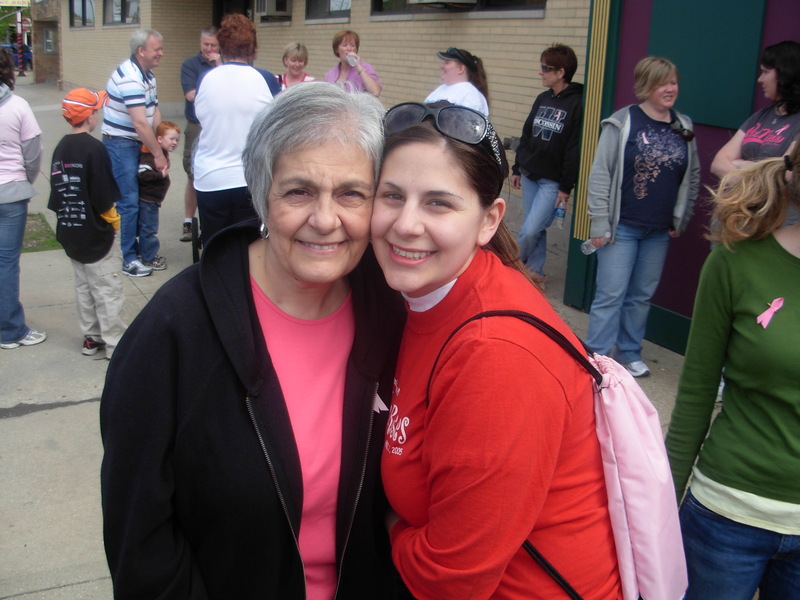 The part I’m looking forward to the most is the Y-Me Mother’s Day Walk. 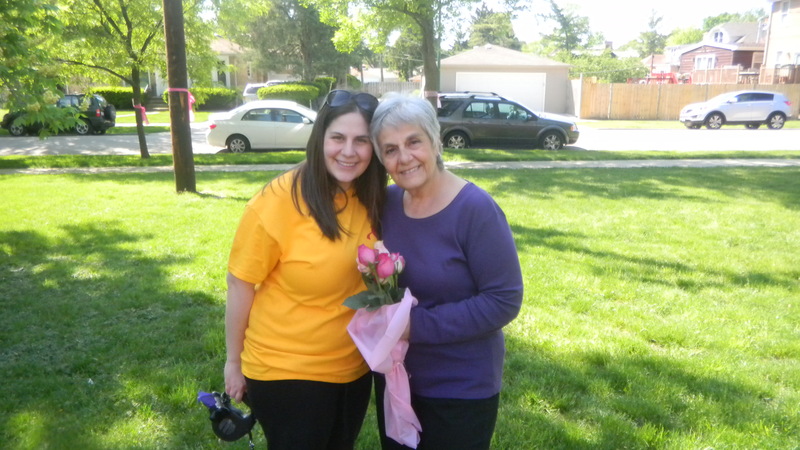 My mom and I have been starting our Mother’s Days with this walk for the past three years. I’m happy that my in-laws joined in the fun a couple years back too. Now, Mother’s Day is a fun way of joining both families together for an important cause. I try to raise money too. Combining all three years, I’ve probably raise close to $700! I’m hoping to get up to a total of $1,000 for four years worth of walks this coming Sunday. If you’d like to support this wonderful cause, please visit my donation page for more information. Have a wonderful Mother’s Day weekend, and Happy Mother’s Day to all the moms out there! The other day, I was checking out my savings progress sheet, and I became quite proud of myself. Starting January 1, up to now, we’ve saved a recorded total of: $512.11! All of that came just from couponing (clipping coupons from the Sunday paper and printing coupons available online) mixed with buying items when they are on sale. I was quite impressed. Here’s to hoping for continued savings! My dad’s birthday was last week. We celebrated on Saturday, and as usual, I volunteered to bring the party cake. 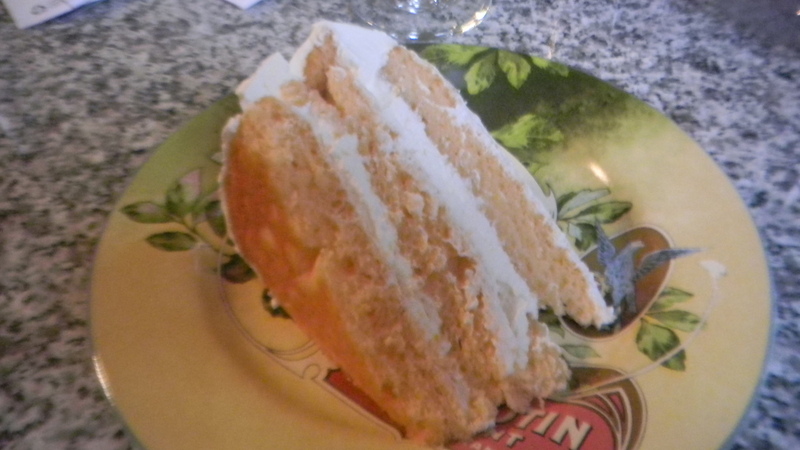 I went with a flavor I knew he would love – creamsicle! I tried to figure out how to make it without breaking the calorie bank. A while back, I had seen a great idea on pinterest. 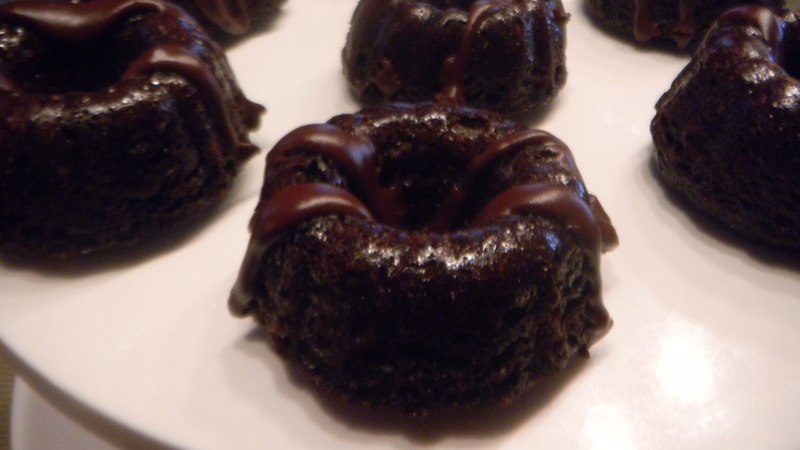 You add diet pop to cake mix (no eggs, no vegetable oil), and it help keeps the calories down. I decided to give it a whirl. 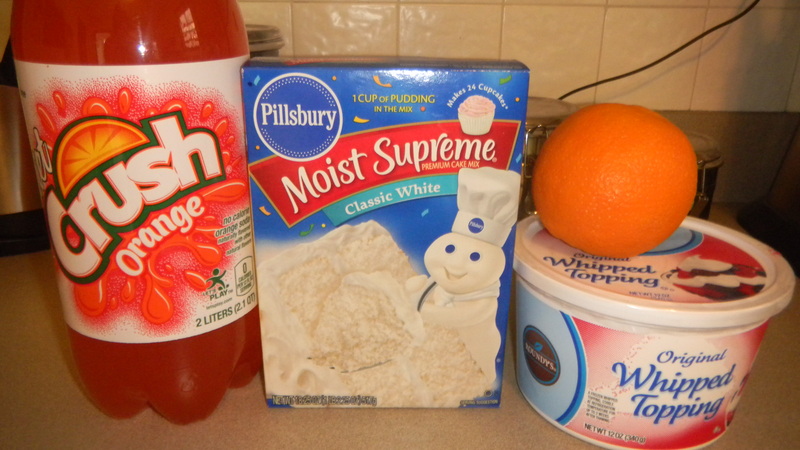 White cake mix, 12 oz of diet orange pop, a tub of cool whip, and an orange. Start by pouring the cake mix into a bowl. Add 12 oz (1.5 cups) of pop. I stirred it a few times with a plastic spoon, then used a hand mixer for about a minute. Next, cut the orange in half. Zest half the orange and add it to the batter. 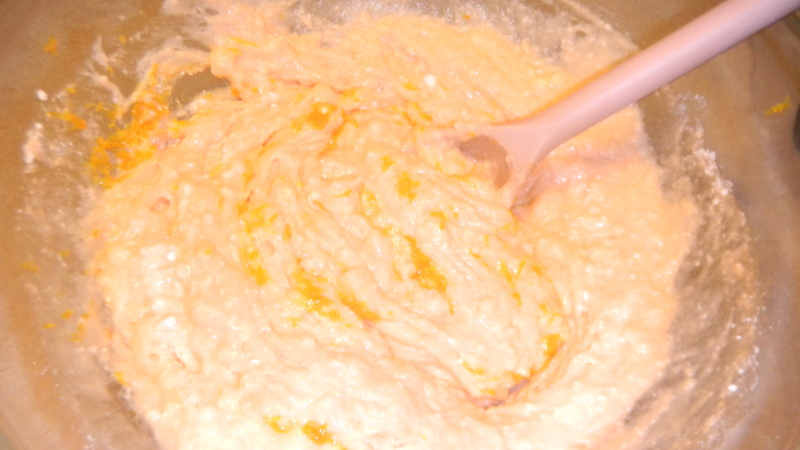 Squeeze that half’s juice in as well, and use the mixer for another 30 seconds. 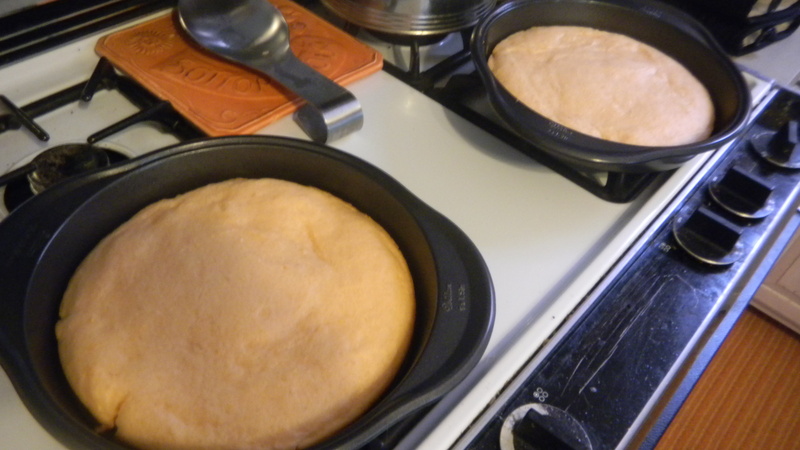 I decided to make a 3 layer cake, so I poured a third of the batter into each 9 inch cake pan. 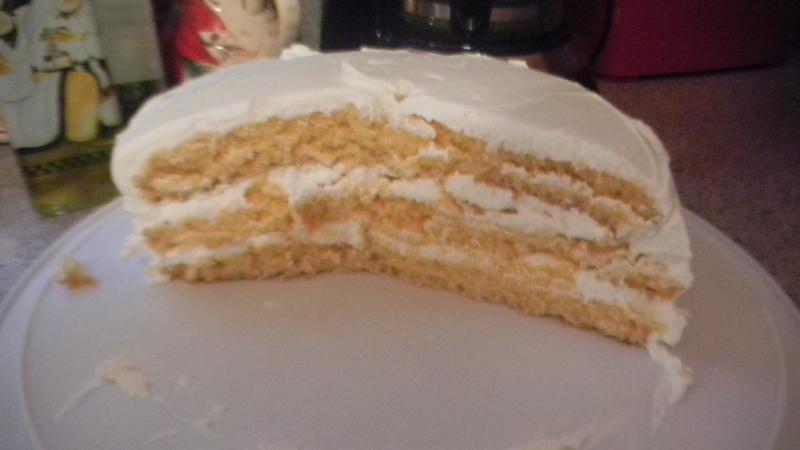 Bake each layer for about 16-20 minutes, turning once half way. Let the layers cool completely. 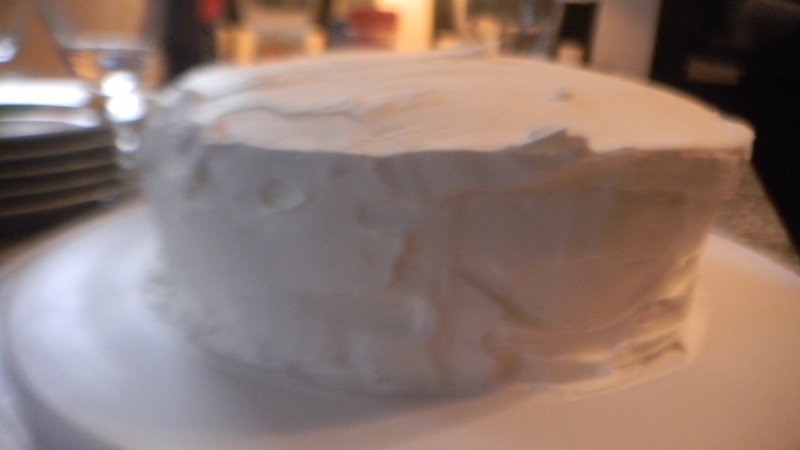 While the cake is cooling, start making the frosting. Pour the cool whip into a bowl. Zest the other half of the orange and squeeze the juice out of it. Add to the frosting. Put one layer of cake on a place. Scoop a generous layer of cool whip on top. Do the same two more times. 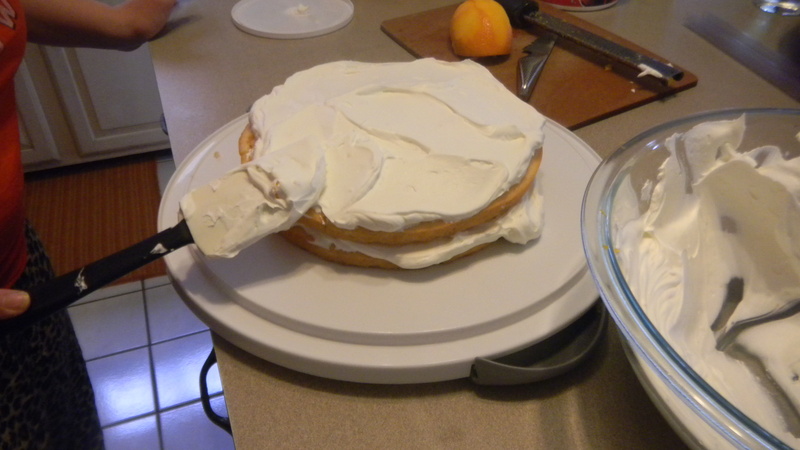 Use the remainder of the frosting to fully cover the cake. Recently, Dan and I hosted a wine party for our friends. We decided it would be fun to do a wine tasting, with everyone bringing a bottle to share. 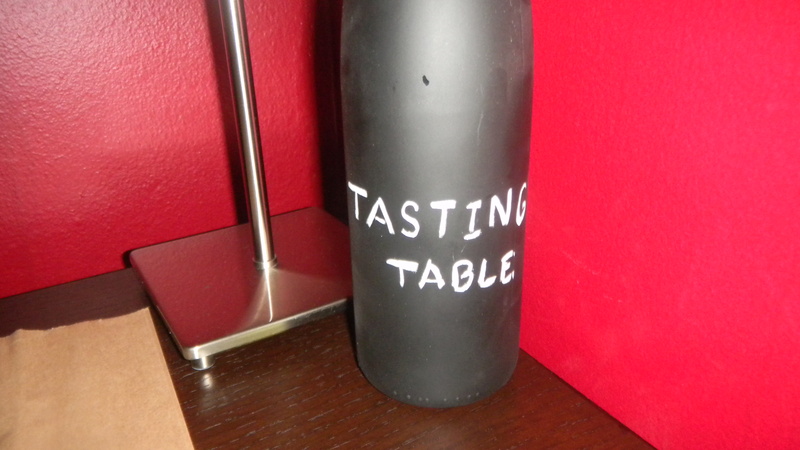 I had come across the idea of a blind wine tasting, meaning you wouldn’t know what wine you would be tasting, and I thought that sounded interesting. We’re not a group of wine snobs, but the idea that we’d judge a wine just on its taste appealed to me. 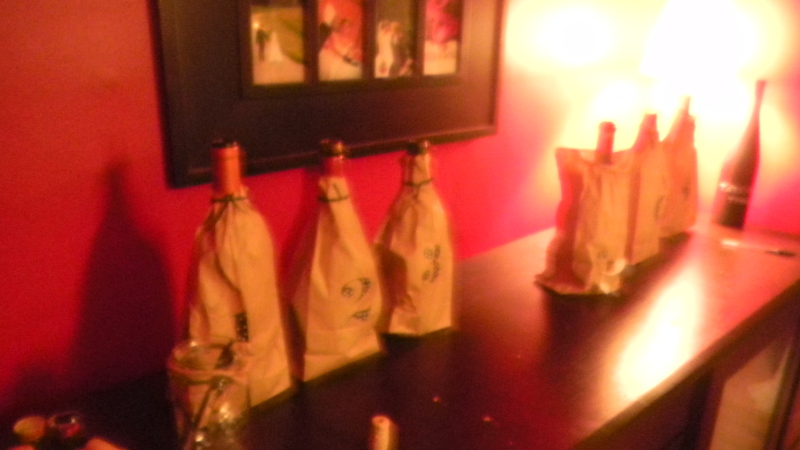 So, I set up the wine bar with brown paper bags with numbers on them. As guests arrived, I took the wine bottle from them. Without looking at the labels, I put each bottle in one of the bags, and secured the bag with a black ribbon. This way, no one knew which wine they were tasting. We went through the bottles, starting with 1 and going through 8. 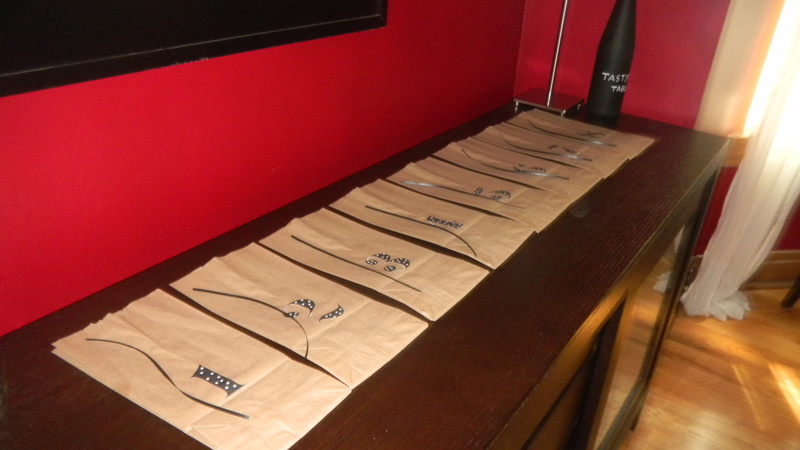 We gave everyone a wine scoring sheet (Dan designed it to match the numbers on the bags), so they could take notes. At the end of the tasting, you had to rate the wines. Your favorite was #1 and your least favorite was #8. We tallied up the scores, and it turns out, a less than $10 bottle of wine won – The Usual Suspect Cabernet Sauvignon by Big House Wine Company. Of course, there were prizes. First place received two wine bottle stoppers and second place received some note cards. A fruit/nut plate, and a ton of chocolate. For decoration, I kept it simple and used the wine corks I had been saving to fill the bottom of glass candle holders. Unfortunately, I didn’t remember to take photos. Boo. 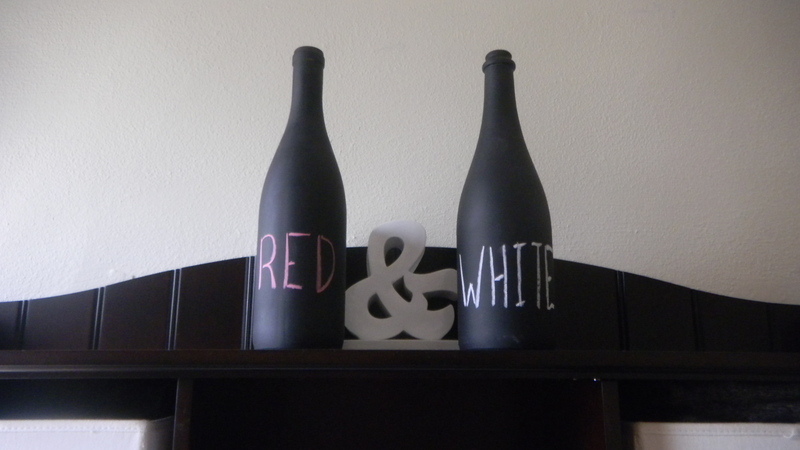 I also put those spray painted wine bottles to use. and the last one let you know where the wine was. Overall, I’d say this party was a success. Next time, I think I would specify whether people should bring a bottle of red or white. Surprisingly, 7 of the 8 guests brought a red wine. Only one person brought a white, and it was a sparkling prosecco. 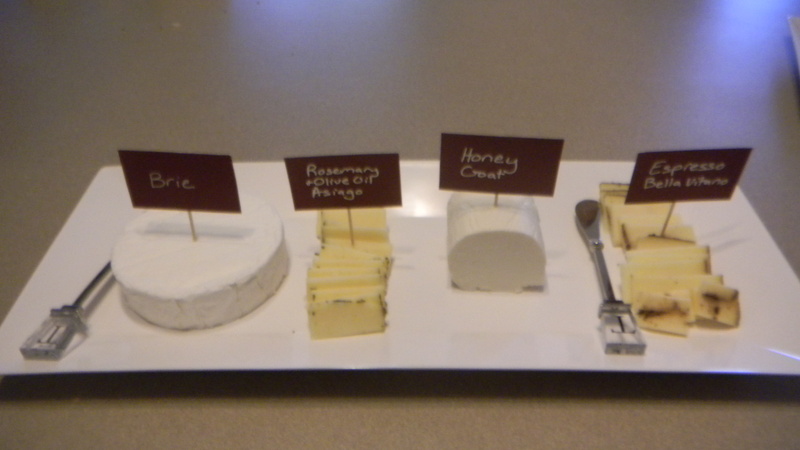 It worked really well that we had mostly red, which made comparisons easier. Everyone had a fun time, and we turned an eight wine tasting into a four hour affair. We’ll definitely have this party again!